May 1st is celebrated as Labor Day in many parts of the world. It is traditionally celebrated as a spring festival and is known as the International Worker’s Day in 80 countries around the world. This is the time of year wherein workers are given paid time off and allowed to relax and enjoy. At the same time, labor unions take to the streets to ask for labor reforms, usually in the form of increase in wages. Labor Day only started in the late 19th century, as the world was growing from massive industrialization. The Australians are attributed as being quite progressive in terms of workers and laborers. After all, the people in Australia were the first to advocate an eight-hour workday. This was called the 8-hour day movement. This meant that the 24-hour day should be evenly divided into 8 hours for work, 8 hours for rest and the last 8 hours of the day set aside for recreational activities. The Labor Unions in Australia and in many parts of the world were pushing for better working conditions, including cutting back on working hours. 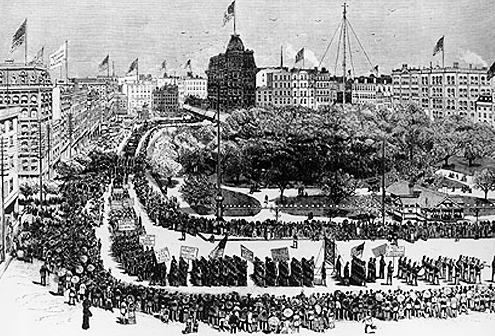 However, it was in Chicago that the first May Day for employees really took shape. The 1886 Haymarket Massacre in Chicago was the catalyst for this holiday. The working class in the United States self proclaimed an 8-hour workday without the approval of their employers. The Federation of Organized Trades and Labor Unions, the predecessor of the American Federation of Labor, declared in 1884 that a legal workday should only constitute 8 hours of work beginning May 1, 1886. It was in the United States when workers first walked off their jobs on May 1st, thus creating the holiday from thereon. More than 300,000 workers from 13,000 businesses all over America participated, thereby changing the lives of the working class forever. At that time, the people behind the 8-hour movement were considered anarchists. The roots of the holiday have quite a violent history since labor unions and industrialists relationships have traditionally been fraught with tension. There were May Day riots in 1894. Even in countries such as China, Cuba and the Soviet Union, May 1 or the May Day celebrations have been marked with many demonstrations. The celebration of May Day traces its roots to Celtic origins. The Walpurgis Night, which is a Germanic celebration that honors Flora, the Roman goddess of flowers, is celebrated on the first of May. May Day is on the half-year mark from November 1, which marks the end of the winter season in the Northern hemisphere. Many baudy celebrations are held to honor the end of hard winters. February 1 is the first day of Spring, while May 1 is the first day of summer. However, as with many pagan traditions, the May Day festival was adopted as a secular activity thanks to the spread of Christianity in many parts of the world. This is why the May Pole, which has largely been symbolic of fertility, has been replaced by the crowning of flowers of the Blessed Mary. For Christians, May is considered the month of Mary. At the same time, May 1 coincides as the feast of St. Philip and St. James, who are known in the Christian community as the patron saints of workers. In 1955, St. Joseph the Worker was declared the patron saint of workers, craftsmen and those people fighting communism. In Canada, the day of workers is celebrated every first Monday of September. This has been the practice since the end of the 19th century. This is similar to the celebration of Labor Day in the United States. This coincides with the last long weekend of summer, before school starts in the fall season. This gives families in North America the opportunity to celebrate the summer with a few activities before the start of the school year and the cooler season. Also, given that the original May 1 Labor day Dore than a century ago was marked by violence, US President Grover Cleveland deemed it wise to move the Labor Day celebration to September, so as to remove the association of celebrating violence. Many parts of the world celebrate Labor Day on various days of the year. In Australia, it is celebrated on the first Monday of October in New South Wales, South Australia and in the Australian Capital Territory. However, it is celebrated on the second Monday of March in Tasmania and Victoria, while the first Monday of March is Labor Day for those in Western Australia. On the other hand, Queensland and Northern Territory declare the first Monday in May as the day to celebrate and recognize workers. The reason for the variances in the dates is that each state and territory government is given license to determine their Labor Day holiday. In Brazil, Worker’s Day is the time when minimum wages are annually adjusted. In Argentina, it is an official non-working holiday. Since 1931, Chile has been celebrating May 1 with festivities, cookouts and rallies. Hongkong, Pakistan, Malaysia, Singapore, Sri Lanka, Vietnam (International Labor Day), Thailand (National Labour Day) and India (often called Maharashtra Day or Gujarat Day) recognize May 1st as Labor Day. However, in Japan, it is not designated as a national holiday. May 1 in China marks the country’s three Golden weeks. Workers are given three days off, although since 2008, workers only get one day off in May while the other two days are taken off in April and in June. In the Philippines, Labor Day was first celebrated in 1903 and is called Araw ng mga Manggagawa. The Germans have been celebrating Labor Day or the Day of National Work (Tag der Arbeit) since 1933, while the Swedes have recognized the holiday since 1938. The United Kingdom, Belgium (Feest van de Arbeid), Croatia, Portugal (Primeiro de Maio), Spain, Serbia, Greece, Turkey, Italy (Festa del lavora Italiano) and Russia (The Day of Spring and Labor) also celebrate on the first of May. Labor day is also recognized in Egypt as well as in South Africa. All around the world, May 1 is the time when workers and employees can take the time off and give themselves a pat on the back. Although the origins are all together pagan, Christian and oftentimes associated with violence, May 1 has become an important day for laborers. Many reformist groups are still pushing for better working conditions around the world, but May 1 as Labor Day is a significant step in the better treatment of workers and gives employees the due recognition they deserve.